The historic 2005 DARPA Grand Challenge held out a $2M prize to the team that could build a fully autonomous self-driving robotic car to navigate over 200 miles of Mojave desert terrain. Perrone Robotics spearheaded semi-finalist Team Jefferson with “Tommy,” a silver egg-shaped dune buggy driving completely under Perrone Robotics’ MAX-based software platform. In 2004 the Defense Advanced Research Projects Agency (DARPA), the Pentagon’s research arm, established the first DARPA Grand Challenge. A $1M prize was held out for the team that could build a fully autonomous robotic vehicle that could self-navigate over 150 miles of Mojave desert terrain. There would be no drivers onboard and no one in remote control. The challenge proved difficult as no vehicle made it more than a few miles. In 2005 DARPA upped the ante to $2M dollars. Over 195 applicants applied, and only 43 applicants ultimately made it past the process to the semi-finals at the California Speedway. 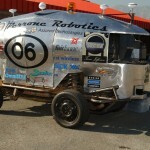 Perrone Robotics’ spawned “Team Jefferson,” and their vehicle “Tommy” was one of the vehicles invited to the semi-finals. After some trials and tribulations, Team Jefferson ranked among the top 20 vehicles during the semi-finals. With a budget of only $60K, a single $200 processing platform, and 10 man-months of software development time, the effort demonstrated just how much could be done to create an advanced and highly complex autonomous ground vehicle leveraging the MAX general purpose robotics software platform. The competition featured major university programs and corporate-backed programs. Some teams reportedly spent $3M to $5M, hundreds of man-hours, and leveraged high-end processing and sensing platforms. The talent and dedication of these teams was extraordinary. Yet Perrone Robotics’ demonstrated that with just a little money down and minimal time spent, a rich robotics platform such as MAX could be used to field a competitive entry to the world’s most advanced robotics competition.